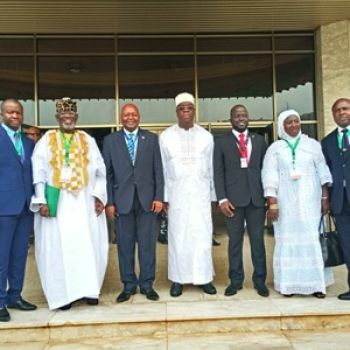 (Abuja, May 14, 2018:)The Liberia Delegation to the ECOWAS Parliament says the country has taken appreciable steps to make meaningful contributions to the overall goal of attaining the vision of the ECOWAS Community by 2020. The Delegation’s assertion was contained in its Country Report that was presented to the regional parliament’s ongoing 2018 First Ordinary Session over the weekend, a release from the Liberian Embassy in Abuja says. According to the release, Lofa County Representative, Honorable Clarence K.M. Massaquoi, read the Country Report, compiled by its five members. Honorable Edwin M. Snowe, Jr. of Bomi County leads the Delegation which also includes Senator Prince Y. Johnson of Nimba County, the Third Deputy Speaker of the ECOWAS Parliament. Others are Bomi County Representative Hajah F. Siryon and Lofa County Senator Stephen J. H. Zargo. The presentations of Country Reports form part of legislative agenda for the ongoing 21-day session of the regional parliament which opened on the 10th of May, 2018 and will end the 30th of May, 2018, the release adds. According to the release, the Liberian Delegation’s Country Report covered the current political and security situation in Liberia; the status of the implementation of the Community Texts; and the progress achieved so far following ratification of the Community Protocols and Conventions, implementation of the Community Programs. Other areas covered in the Report include the status of implementation of the ECOWAS macro-economic program as it relates to level of achievement of convergence criteria; the status of implementation of the ECOWAS infrastructural and transportation policies and programs; and the sensitization activities carried out by parliamentarians. On Liberia’s delayed remittance of its share of the Community Trade Levy for the last quarter of FY2017, the Liberian delegation regrets the situation which it said is due to delays in both the electoral and the transition processes back in the country. It then assured the Parliament: “As the [new] Liberian government takes shape, every necessary step is being taken to ensure that settlement of this payment is made to put the county in good standing with the community”. The convening of the current 2018 First Ordinary Session is in line with the stipulations of Article 27 of the Supplementary Act of the Parliament which provides that the ‘Parliament shall meet twice a year in Ordinary Session’. The five-member Liberian Delegation forms part of the one hundred and fifteen (115) members of Parliament from ECOWAS’ 15 Member States that represent over 320 million people at the ECOWAS Parliament, the release concludes.